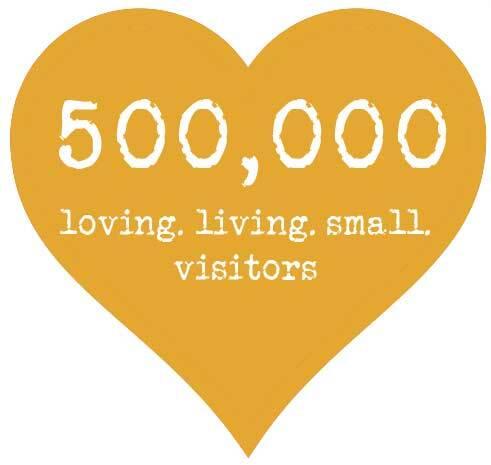 I was super excited to see that my little blog has reached a big milestone - over a half a million visitors!!! I can't believe that what started as a place to virtually store my inspiration has become a place for other people to embrace inspiration as well. I seriously can't get over the amazing comments and personal emails from you guys. I absolutely appreciate it and thank you for reading and engaging in loving. living. small. Love it! So *cheers* to 500,000 of you! This is still my personal blog and I look forward to sharing more inspiration with you guys. In the meantime, here are ten of my fave posts since I started this little blog in 2008. *I still LOVE a striped wall. And I still own that issue of New York Mag, framed in my office here. *These 2 pillows that I spotted in a 2001 Lucky mag issue jumpstarted my love of design. It really does just take one thing to get going. *I loved this idea of framing book covers - super clever. I was only 4 weeks old and this was the first post that was picked up by a big website. This time - Renest. *I really do love this duo of mirrors and must try it in my own small space. *One of my many many many posts about how inspiration can be spotted *everywhere*. In this case, a pretty Vogue mural painted on a wall in Maryland. *Use your rooms for your needs not for their names. Goodbye eat-in-kitchen, hello home office. *This was my biggest traffic post to date - Apartment Therapy's post about loving. living. small. Ironically, this was just a few weeks before they sent out the call for new bloggers. I applied and I was invited to join the ATLA team in mid-July 2008. *I always like this small space plus these 10 tips for making it work. *You guys were SO helpful in helping me a choose a fabric to recover this chair. While I didn't recover this one, I did use the black and white fabric to recover these. Want a little more loving. loving. small. love? Check out my pinterest boards here - there are over 19 of 'em. And follow me on twitter right here. hi! Wow, many congratulations on your huge blog milestone!